In these days of styling gimmicks , of pre occupation with packaging to the extent that it doesn't matter what's inside as long as the packet looks nice, a touring caravan that has remained basically unaltered for nearly twelve years can mean one of two things. Either the manufacturer is not very aware, his design department content to trot out the same old ideas year after year, or, as in the case of the subject of this month's road test, the design was so well conceived in the first place that any change could only be for the sake of change. True there have been slight modifications to the original design, the biggest of these, in 1956, being a slight increase in length to enable alternative models to be offered with or without a toilet room. 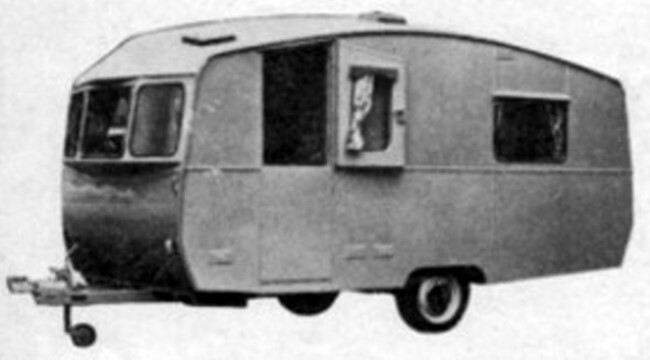 This concession to demand from the caravanning public reflects the popularity of Thomsons among club members and the increase in Continental touring which even then was beginning to show signs of its present day proportions. At the same time the prominent Vee roof, an unmistakable Thomson recognition feature until then, was smoothed into a rather more contemporary line, still Vee -shaped but with end peaks and a bay front, and the model name changed from Almond to Glenalmond . The model tested was the Mark 1V with toilet room. The layout is basically two single beds at the rear, kitchen and wardrobe amidships and a three- seater dinette and toilet room at the front. For reasons which took us some little time to clarify, the team kept referring to the end with the single beds as the front. 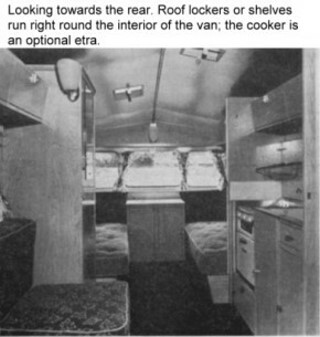 Two singles at the front end is, of course, accepted practice in the majority of touring vans these days, and in fact when we tested the original Almond in 1954 we reported that we would have preferred the layout reversed to bring the singles and main dining area to the front, providing this did not affect the weight distribution. But Thomsons can see no reason to change and we found the layout far from inconvenient during our test. The construction is very robust and towing performance was not very far short of being perfect. We took the van over what must surely be the worst stretch of road in Scotland, namely the famous Road to the Isles from Fort William to Mallaig . Although the Caravan Club handbook gave dire warnings that this stretch of road should be avoided at all costs owing to extensive road reconstruction, we argued that we were out to test a van and this seemed as good a way as any. The Glenalmond stood up to this treatment very well. Certainly the mattresses jumped about hut the gas mantles stayed intact, all cupboard and locker doors remained firmly closed and opened packets of food in the larder retained their contents. On rather better class roads the stability was excellent and on the well-surfaced sections of the test track 60 mph came up quite easily with no trace of snaking. Slight surface irregularities tended to cause a little uncertainty at this speed behind the Morris Oxford V and probably 50 mph would be the more comfortable cruising speed on Continental main roads. Our test of the Thomson was slightly longer than usual and the mileage correspondingly greater. It says much for the towability of the Glenalmond that we well exceeded our pre-conceived 'paper' average and were able to put nearly 200 miles into a day without any appreciable effort, stopping many times for photographs and meals, and this on tourist-cluttered Scottish roads, many of which are renowned for being none too generous in width. The practicality of this van does not end with its performance on the road; obviously a lot of thought has gone into the layout. Immediately opposite the door is a three- seater dinette, comfortably close enough to the kitchen for the table to be used as extra work surface if needed. 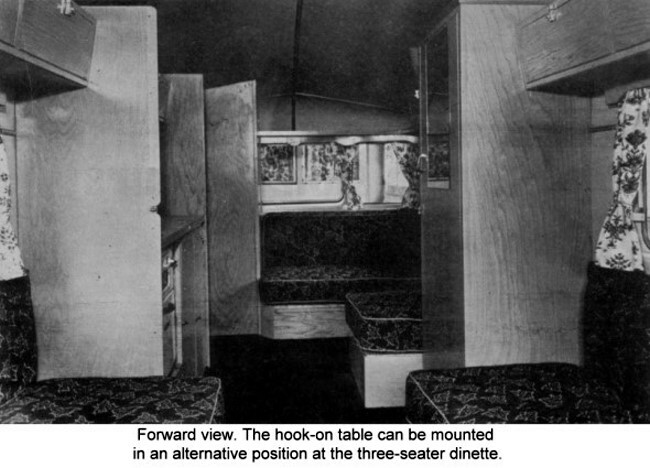 Although the main dining position would be considered to be at the rear with the table in its prin­cipal mounting position between the single beds, in which case there is ample room for four to eat in comfort, more at a pinch, the dinette is ideal for, say, a late meal or coffee after the children have been safely stowed and the partition flaps closed. Adequate bedding storage space is provided in top access lockers. The double seat against the front wall of the van has a hinged lid and the lid over the single seat, which although it contains the frame of the pull-out extension still has plenty of storage space available, is fully removable. The table completes the plat­form for the double bed which is a full six feet long. It was found, however, that with suit­able re-arrangement of the mattresses a shorter but wider bed could be obtained. The two singles in the front compartment are slightly shorter than the double and if used for children would be adequate. The six-footer in the test team, admittedly using a sleeping bag, had no trouble in tucking his feet round the front of the wardrobe and did not find the position uncomfort­able. The single beds have padded, fluted backrests which do not steal sleeping space. Top access bedding lockers are generous and will take a suitcase. 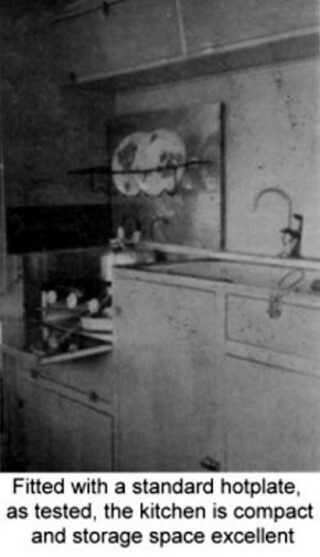 Between the singles is a cupboard with a vanity top, a shallow tray with a hinged lid to the under­side of which is fixed a mirror, and the test team, having no use for the various cosmetic preparations which would undoubtedly find their way into this compartment if this was a family van, found it useful for stowing the table cloth and mats. The two doors to the cupboard are hinged in the centre for easy access to the shelved interior when the table is erected. The fair-sized wardrobe has plenty of hanging space from a sliding rail and the provision of four coat hooks is an inexpensive refinement that the makers of much higher priced vans could well copy. A shelf at the bottom of the wardrobe rests on the wheel-arch and there is room beside the wheel box for one or two pairs of shoes. The wardrobe is not full height and the top is lipped to form another useful shelf. The door, which is piano-hinged, has a large mirror on the outside and the partition flap is hinged to the inside. A large throw-over door catch provides security on tow. The kitchen, opposite the wardrobe, has a Dudley two-ring and griller hotplate in an aluminium -lined recess. The hotplate is on an aluminium shelf with space underneath which we found ideal for storing frozen foods-while the hotplate was not in use, of course-but this space is lost if the optional extra oven cooker is specified. A fall front flap can be chained to a horizontal position for added work space. The hinged lid to the hotplate compartment is faced on the underside with aluminium and the folding plate rack attached to it proved invaluable when raised. The cupboard below the cooker has a shelf resting on the wheel-arch. The space in front of the wheel-arch is ideal for bottle storage ; there was enough height for milk bottles to be stood in a carrier but wine bottles had to be laid fiat. This space also houses the gas fire point and a small hole is drilled in the bottom rail of the cupboard for the hose to pass through without interfering with the opening and closing of the cupboard door. In the test van the Perspex sink and drainer was fed from the optional extra Whale angled pump drawing water from cans outside the van. This arrangement is better than a tank in many ways, but it was unfortunate that the sink waste outlet was placed so close to the fresh water intake ; if care was not taken in placing the water can one was apt to find the same water being used time after time. The lid to the sink and drainer is faced on the underside with aluminium and has a double fold, over on top of itself and then up against the side wall facing the cook. It would be better if it folded up against the full height bulkhead to the forward end of the kitchen as in its present position it makes use of the pump awkward. Under the sink is the well-ventilated gas locker which is neatly filled by a 321b. cylinder. This is sensibly placed as close to the axle line as practicable able so that weight distribution on tow is affected as little as possible if the cylinder is removed. Under the drainer is a cutlery drawer which, while small, took a considerable amount of table ware ; it would not take the fish slice or the bread knife. The drawer tended to stick very slightly. The larder below seemed at first sight to be small but the two shelves are carefully spaced above the floor and each other so that no height is wasted between them. In all there is better stowage in the kitchen than in many much larger. Roof shelves or lockers are placed right round the interior of the van including the toilet room. The shelves are slightly narrower than the lockers and are lipped to prevent things rolling off. The lockers have spring catches and the doors are hinged at the bottom so that they do not have to be held open when in use. The lockers are placed in pairs and could well be divided to stop the contents sliding about while on the move, but this is a minor improvement that most owners could carry out quite simply. The lockers do not go right up to the ceiling and the tops make extra shelves on site. The roof lockers over the kitchen are fitted with crockery for four people-cups, saucers, tea and dinner plates, and fruit bowls. The crockery is Thomson pattern and is included in the basic price of the van, surely the only van on the market to be so equipped at no extra cost. The toilet room in the nearside front corner takes in the porch of the only door when in use. When not in use the floor space available is just about enough to take two water cans if care is taken over positioning the closet before it is screwed down. There is a shelf above and below the frosted glass, non-opening window and ventilation is taken care of by a low wall vent and a rooflight . In use the door of the toilet room mates up with the kitchen bulkhead and a small triangular flap on the inside of the door lifts up to complete enclosure up to the peaked roof; if this flap is not used at night a fair amount of borrowed light is available. The two bijou gas lights give adequate light to the two table positions but leave the kitchen a little dark, especially as the cook gets in the way of illumination from the nearest light. During the day the generous window area makes the interior bright and airy and the amber Perspex roof vents take good care of top ventilation. The fitted carpet, two-tone moquette mattresses and gay cotton print curtains (on overlapping strainers) lend an air of quiet luxury to the Glen-almond that is worthy of a van in a much higher price bracket. Here and there one can find small irregularities in the cabinet work but they do little to mar the overall effect. The Scots are reputed to extract full value for their money. Certainly in this instance they give it too. Dimensions: Length body net l4ft. 2in., overall l4ft. 11½ in., shipping I7ft. 2in., interior l3ft. 9in. Width overall 6ft. 9in., interior 6ft. 4in. Height overall 8ft. 3m. max. headroom 6ft. 4in. floor height 2lin. Weight: As tested 18½ cwt. ; nose weight 1½ cwt. Undergear : (sketch not to scale) Boden welded steel chassis, reinforced at points of max. stress. A 3½ x 1½ x ?in. channel. B 2½ x 1 ½ x 5/32in. angle. Axle 1¾in. diameter, straight. Springs underslung 4-leaf 33 x 2 x ? in. Brakes 8in. Girling ML, cable operated, turnbuckle and pulley. Wheels 5-stud ventilated disc, tyres Firestone 5.90-15 4PR. Coupling Bradley Doublelock , telescopic jockey wheel. Four brace-operated legs. Body construction: Framing Meranti , halved, screwed and glued. Outer panelling 2Og. aluminium walls and roof. Fibreglass insulation. Inner panelling hardboard. Floor¾in. t and g, treated. Glazed stable door 62 x 21in. Round-cornered polished alloy windows, 5 opening 30 x 20in. ; 6 fixed lights, two 11x 20in., four 19 x 20in. Three amber frameless Perspex roof lights 9½ x 6½in. Four grab handles. Equipment: Two single beds 69 x 24in. top access lockers. Three- seater dinette double bed 72 x 44in. top access locker. Spring interior 6in. mattresses, uncut moquette , padded backrests. Sen panelled furniture. Hook-on table 42 x 21in. Shelved cupboard with vanity top. Wardrobe 23¾ x 17¼in. hanging space 51in., 4 coat hooks. Six roof lockers, roof shelves. Dudley 2-ring griller hotplate ; Perspex sink and drainer two-fold drainer lid, aluminium lined. Ventilated larder, ventilated gas locker, pan locker. Fitted crockery. Toilet compartment, floor area 44½ x 27in. max., ventilated. Fitted carpet, lino in toilet ; cotton print curtains, pelmets, overlapping strainers. Two bijou gas lights. Full road lights and indicators. 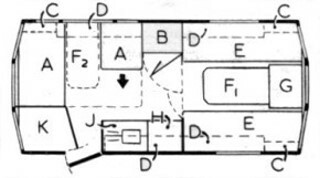 Layout: A dinette, B wardrobe, C roof shelf, D roof lockers, E single bed, F table, G cupboard, H cooker, J sink, K toilet. Makers: Thomsons (Carron) Ltd., Carron, Falkirk, Scotland. Towing car for test: Morris Oxford V, weight inc. crew 27 cwt. "Reproduced from an article in the September 1961 issue of The Caravan"